NOTE: DO NOT address packages in "Care Of" (C/O) our company name... use only YOUR NAME. And please read about our mail and parcel services for more information about how to address your items. There are a couple of primary routes that can be taken to reach Blaine. Hwy 99 from Vancouver, or 176th Street from Cloverdale and Surrey are both convenient. NOTE... crossing the border at the Truck Crossing on weekdays before 9:30am is usually a SHORT line to wait in. At 8:30, we generally wait about 5 minutes in the regular lane!!! Click on Maps below to see larger map. If you take Hwy 99 from the Vancouver or Richmond areas, it is probably best to take the 8th Avenue off-ramp and go to the "truck customs" border crossing, which is located on Pacific Hwy, about 1 kilometer east of hwy 99. 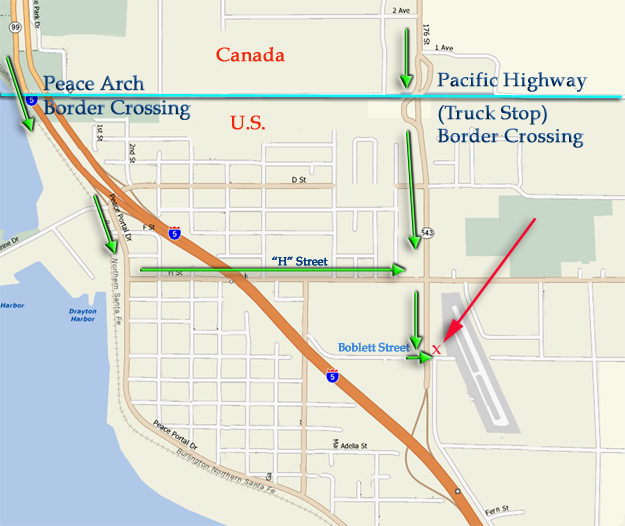 Generally speaking, clearing customs at Pacific Highway (truck customs) is usually faster, and it is for both commercial and private individual crossings. They also have Nexus lanes which can dramatically reduce the amount of time it takes to cross the border at both Pacific Highway and Peace Arch crossings. 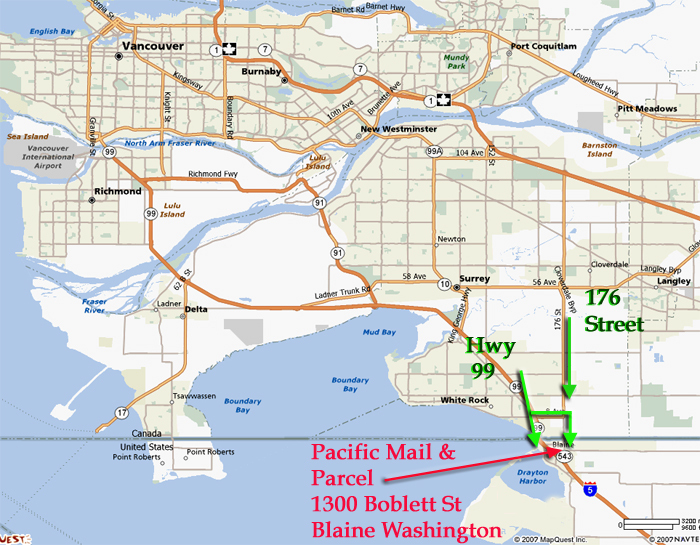 Anywhere in Surrey or Cloverdale, get on 176th Street and head south. You will get to the Pacific Highway border crossing. After leaving US Customs and Immigration, drive south on the main road away from the border. The 2nd traffic light is Boblett Street. (this should be the last traffic light before getting on I-5.) Turn left on Boblett. Turn left into the first driveway on your left. You are at Pacific Mail & Parcel. After leaving US Customs and Immigration, take your immediate right off-ramp at the beginning of I-5. (DO NOT get on the highway). Turn Right at the traffic Light onto Peace Portal Drive. Go approximately 200 meters (or yards if you like) and turn Left on "H" Street. Go to Pacific Hwy (Route 543) and turn Right. At the next street, Turn Left, and Left again into the first driveway. 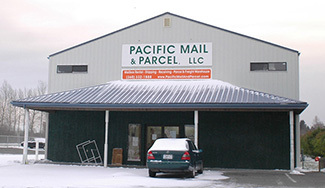 You are at Pacific Mail & Parcel.